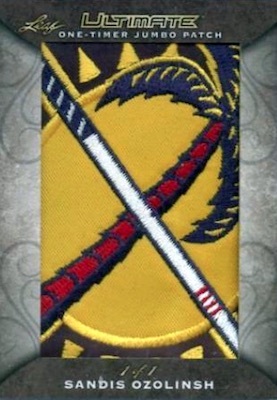 One of the more premium hockey options from the card brand, 2017-18 Leaf Ultimate Hockey sees a significant change from prior years. The limited production continues, but the format drops to three autographs or memorabilia cards per box. The hit-only set offered a total of three autographs and three relics in 2016-17, cutting the yield in half for '17-18. The case size does pick up the difference, going from six to 12 boxes. 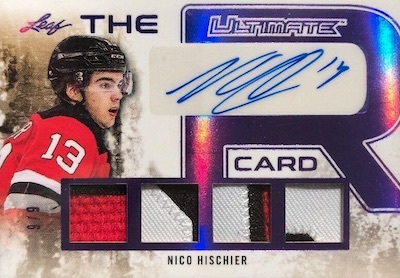 Featuring autographs and signed relics, the 2017-18 Leaf Ultimate Hockey checklist includes The Ultimate Rookie Card and Ultimate Rookie Signature Patch cards for the top overall 2017 NHL Draft picks, Nico Hischier and Nolan Patrick. 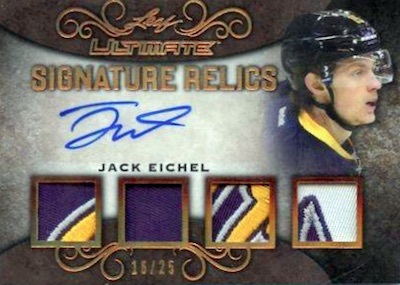 Ultimate Signature Relics focuses on key names with four relic pieces and an autograph, while Ultimate Auto Memorabilia goes jumbo. Other choices come via Ultimate Signatures, Ultimate Signatures Dual, Ultimate Signatures Triple, Ultimate Signatures Quad, Ultimate Signatures Six, and Ultimate Signatures 8. 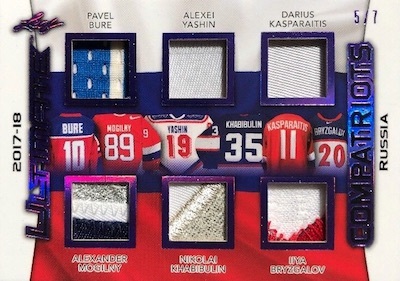 Not shocking to anyone who has seen past releases, 2017-18 Leaf Ultimate Hockey is also filled with many different relics. 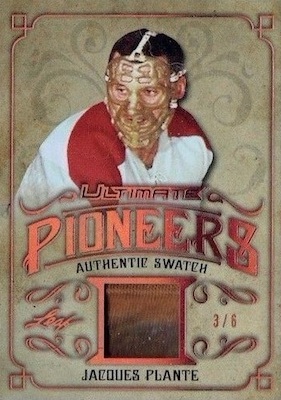 The Ultimate Pioneers and Ultimate Pioneers Quad sets both cater to the early legends, while The Ultimate Card presents a memorabilia collage, of sorts, with eight swatches for one player using an assortment of items. Based around country affiliation, Ultimate Compatriots highlights six players per card. Ultimate Equipment is a quad relic for one subject. Additional multi-player inserts include Ultimate Memorabilia 4 and Ultimate Memorabilia 6. Both have Prime parallels. Only featuring prime swatches, Ultimate One-Timer Jumbo incorporates oversized pieces. 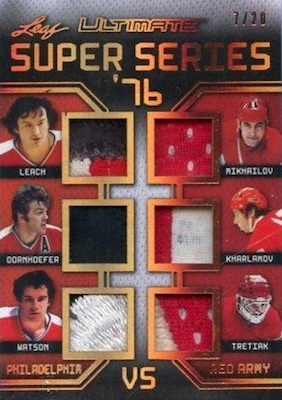 2017-18 Leaf Ultimate Hockey also has a special six-player relic set—Ultimate Super Series '76—which highlights the 1975/76 winter exhibitions between NHL and Soviet club teams. New this year is the Ultimate Choice Memorabilia redemption that allows collectors to pick their preferred option from the Leaf website. 2017-18 Leaf Ultimate Hockey consists of 125 total cases, or 1,500 boxes. 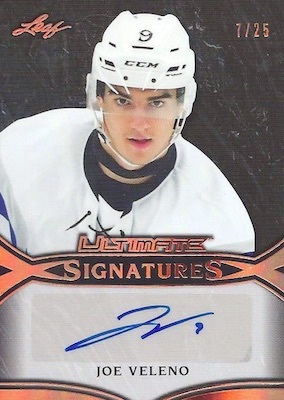 Shop 2017-18 Leaf Ultimate Hockey cards on eBay. SPECTRUM PARALLELS: Purple #/7 (Howe #/5*), Blue #/5 (Estevez,Howe #/4*), Magenta #/3, Silver #/2, Green 1/1, Gold 1/1, Printing Plates 1/1. SPECTRUM PARALLELS: Purple #/9, Blue #/5, Magenta #/3, Silver #/2, Green 1/1, Gold 1/1, Printing Plates 1/1. SPECTRUM PARALLELS: Purple #/7, Blue #/5, Magenta #/3, Silver #/2, Green 1/1, Gold 1/1, Printing Plates 1/1. SPECTRUM PARALLELS: Purple #/10, Blue #/7, Magenta #/3, Silver #/2, Green 1/1, Gold 1/1, Printing Plates 1/1. 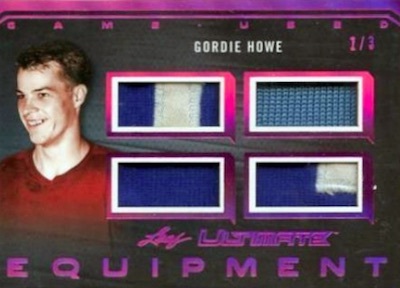 SPECTRUM PARALLELS: Purple #/9 or less, Blue #/5 (Howe #/2; Selanne #/4*), Magenta #/3 (Howe #/2*), Silver #/2 (Howe 1/1*), Green 1/1, Gold 1/1, Printing Plates 1/1. See the spreadsheet for specific parallel print runs. SPECTRUM PARALLELS: Purple #/9 or less, Blue #/5 or less, Magenta #/3, Silver #/2, Green 1/1, Gold 1/1, Printing Plates 1/1. SPECTRUM PARALLELS: Purple #/4 (Card #01,07 - #/9*), Blue #/3 (Card #01,07 - #/5*), Magenta #/2 (Card #01,07 - #/3*), Silver #/2 (Card #03 - 1/1), Green 1/1, Gold 1/1, Printing Plates 1/1. SPECTRUM PARALLELS: Purple #/3 (Card #07,08 - #/9*), Blue #/2 (Card #07 - #/4; #08 - #/5*), Magenta #/2 (Card #07,08 - #/3*), Silver 1/1 (Card #07,08 - #/2*), Green 1/1, Gold 1/1, Printing Plates 1/1. SPECTRUM PARALLELS: Purple #/2 (Card #02,03 - #/3*), Blue #/2, Magenta #/2, Silver 1/1, Green 1/1, Gold 1/1. SPECTRUM PARALLELS: Purple #/2, Blue #/2, Magenta 1/1, Silver 1/1, Green 1/1, Gold 1/1. 7 cards. Serial numbered #/20. SPECTRUM PARALLELS: Purple #/7, Blue #/5, Magenta #/3, Silver #/2, Green 1/1, Gold 1/1. SPECTRUM PARALLELS: Purple #/7 or less, Blue #/5 or #/4, Magenta #/3, Silver #/2, Green 1/1, Gold 1/1. PRIME SPECTRUM: Bronze #/6, Purple #/5, Blue #/4, Magenta #/3, Silver #/2, Green 1/1, Gold 1/1. SPECTRUM PARALLELS: Purple #/5 (LeSueur #/3), Blue #/4 (LeSueur #/2), Magenta #/3 (LeSueur #/2; Armstrong #/4), Silver #/2, Green 1/1, Gold 1/1. SPECTRUM PARALLELS: Purple #/3 or #/2, Blue #/3 or less, Magenta #/2 or 1/1, Silver #/2 or 1/1, Green 1/1, Gold 1/1. 5 cards. Serial numbered #/20. SPECTRUM PARALLELS: Purple #/7 or #/6, Blue #/5 or #/4, Magenta #/3, Silver #/2, Green 1/1, Gold 1/1. View the 2017-18 Leaf Ultimate Hockey checklist spreadsheet. Did two boxes and both were great. Some amazing cards in this product. Thought so much of the first two boxes, ordered two more!